With Steam’s recent insane sale, I found myself doing something I’ve never done before in my 7+ years as a MMO gamer — I purchased, installed and logged into a SOE game. EverQuest 2, to be exact. It’s odder still considering that I’m not trying this game out due to the usual reasons, such as apathy and boredom and burnout with my old MMOs. On the contrary, gaming in WoW with my wife and going solo in Fallen Earth easily takes up 110% of my available playing time. I’m trying EQ2 because I’ve had a long-standing curiosity regarding the title, especially in light of bloggers who are mad for the game, and Steam’s offer of the game plus a month of playtime for $4.99 was too good to pass up. I don’t think I’ll subscribe past this month, but I’m willing to experience the game with an open mind, and if it convinces me… well, we’ll cross that bridge if it comes. I also wanted to dive into this 5-year-old title as a complete newbie (or a “EQewbie”, as I’m calling it), letting the game stand or fall on its own without any prior instruction. I was happy to see how quickly Steam downloaded it, and the EQ2 installer patched it up (something like three hours, start to finish), so on the day I purchased it, I was able to log on and play. Coming from some other titles, EQ2’s character creator is kind of overwhelming. I’m not just talking about the facial/body customizations (which are plentiful enough), but starting with races and classes. Without very much explanation, I’m asked to pick between 19 races (of which there are too many elves for my taste) and 24 classes (!). I wasn’t really sure if playing a “good” or “neutral” or “evil” race had any impact on the game, other than class selection, and this general lack of information carried itself through into the class picks. Hey, there are three types of rogues and skimpy flavor text accompying each! Which is better? How do they play? I have no idea! Whee! So with a willful lack of abandon, I went with what my heart told me was true. 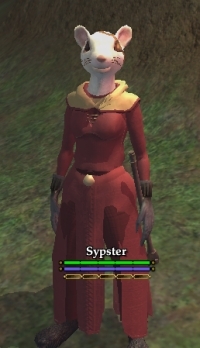 I made Sypster (EQ2 won’t let you make a character with less than 4 letters, for some unknown reason), a Ratonga Coercer. I thought the rat-people kind of cool looking, especially when you gave them an eyepatch, and Coercers, with their ability to temporarily charm mobs into allies, sounded interesting. Game Legs is another term I’m going to introduce here — a spin on “sea legs”, I’m using it to refer to the time it takes for a player (new or experienced in other MMOs) to figure enough out about how the game works and plays to feel as though they have enough of a grip to do something useful. EQ2 is not a brand-new title, and as such, carries half a decade worth of improvements and additions with it. Logging in, I was assaulted with a daunting welcome screen (which is pretty nice, except for beginners), an unfamiliar UI (which was thankfully movable and resizable), tooltips, and tutorial popups. Some of this was pretty familiar to anyone who’s played a MMO, but there’s enough unique quirks (such as having to hit “~” to initiate auto-attack) that it kept me off-balance for a little while. I spent some time moving around, exploring the starter town, claiming my dozen or so rewards (as part of the different expansion purchases), and beating up a few random mobs to figure out the combat. I didn’t like the UI at all — it’s functional, but dithers around DDO’s UI level of unattractiveness. Combat also felt a bit more mushy and abstract in a way that was hard to define. And I suspect that the visuals (especially the “uncanny valley” characters) are an acquired taste, although they certainly aren’t bad, and the performance quite speedy. If anything, EQ2’s audio popped out at me from the start. I really liked the music, particularly when you got into combat and it went a little more up-tempo. But it was the much-vaunted full voiceovers that really got me. I’ve gotten so used to reading boxes of text from questgivers that to have a guy actually talk to me and give me dialogue buttons to maneuver around the conversation was a small delight. This is exactly why I’m excited about the same feature in TOR — quests seem like more than a chore list when you have someone actually talking to you about why they want you to do something. Stuff like the voiceovers and the collections (I found a few sparklies to start my collections, which was fun) are why I wanted to see EQ2 for myself. They might be fairly fluffy elements compared to more modern MMOs, but they also add a lot of flavor and texture to the world in a way that other MMOs have stripped out in favor of a more streamlined process. I don’t think I’ll be diving into crafting — I have Fallen Earth for that, thank you — but I am looking forward to finding my apartment and seeing how EQ2’s housing system fares, especially with the many decoration items I’ve acquired thus far. Questing was pretty standard fare, apart from the voiceovers, but I got a bit of a shock when sometimes the critters would drop treasure chests (which contain better loot) in addition to whatever bit of fur or fang they had on their corpse. The loading screen told me to try /cutemode for a laugh, and when I did so, it blew everyone’s heads up to three times their normal size. This illustrates EQ2’s approach to the game world — it’s not nearly as “in character” as other MMOs I’ve seen, but it has fun with it even so. I briefly tried out an assassin character (bleh), but was impressed when the game asked me if I wanted to import my UI settings from Sypster to match — certainly a nice feature, when you’ve been tinkering with the UI for a while to get it just right. Again, this is all just very beginning impressions — I plan to spend more time with this title over the next couple weeks and see how it shakes out. Depending on how in-depth you want to get, I sincerely suggest finding and installing ProfitUI and EQMaps. ProfitUI makes the overall UI far cleaner (outside of what you can do yourself if you poke around with it), and EQMaps adds POI info to all of your maps for any quest locations, rarespawns, climbable walls, and a whole slew of other stuff. Both are very VERY handy. I wasn’t aware of that EW2 offer from Steam, probably because I don’t actually check out the store on a regular basis. If I wasn’t trying out LoTRO right now, I’d probably give EQ2 a shot. Very nice write up. I haven’t really given EQ2 a chance since it first came out and I hear a lot is different. Maybe I’ll have to go back too! The only old complaint about the game i had was the terrible armors they have. Seconded on ProfitUI and EQMaps. Both are really foundational in changing how you interact with the game. You’re doubtless aware of http://www.eq2interface.com/ but both can be gotten there. I’d advise the self updating varieties for both. EQMaps will want to launch EQ2 automatically. I don’t like that but there is a checkbox to disable it. If you’re interested in checking out the housing options, going and looking at other player’s can be huge fun. EQ2decorators.com have all housing objects available plus a ton of screenshots from players. hmm can pass on a ton of tips if you’re ever in need but feel like I’ve written an essay already! Your character looks like a skaven that’s gone through rehab and become a born-again Christian. EQ2 is an excellent game – far better than WoW – but it certainly lacks the polish and finese that’s required these days. Once you get past the UI and the complicated learning curve, you’ll find a brilliant game underneath. I keep thinking SOE should do a major overhaul of the UI, intro screens etc and re-release the game. @WalterD — to quote a movie, the best assassin (or coercer?) is one who does not know he is an assassin. The cuddlier you look, the closer people will let you get to bite them. Easy. It’s a very cool game for sure. It is a wonderful world full of lore. What’s nice about the factions is you can still play with members of the good or evil races, which is always a good thing. you can always betray and switch factions (class change is the biggest reason for this though). It has a lot of very cool fluff, housing, pets and cool mounts. I especially love the appearance armor tab you gain at level 20. It is a game I re-visit every so often. My biggest problem I have with it is wandering around looking for quests and not seeing many people to group with at times, while leveling. A quest helper revamp is in the works, so maybe it will be smoother once that is released. It could be by now, I haven’t kept up with EQ2 lately. If not http://maps.eq2interface.com/index.php?action=download is a great add on to help. The community is very nice also. Hope you enjoy your stay in Norrath! You should definitely give EQ2’s crafting a go, if only to compare. There’s a beginner’s line of quests for it which briefly takes you through all the different types of crafting that you can do. It’s pretty out of date, but you can look at http://www.eq2ref.com/ to get an idea of the different classes by what abilities/spells they have. It might be the oldschooler in me, but I always recommend that new players start in Qeynos or Freeport, so you can go through the Isle of Refuge, the original tutorial zone. It feels a slightly more gentle introduction to me. Darklight Wood is probably my least favourite of possible starting locations. I’ve never had a problem with the UI myself. It does everything I need it to, and is quite customisable. You can’t really tell what a class is going to be like until you’ve got a few levels, and have a reasonable selection of the core powers. Assassins aren’t too bad once if you enjoy stealth-type classes. They’re not my thing either though. If you happen to be venturing on the Guk server, I’d be happy to keep you company. I’m only 2 weeks into EQ2 myself and I find your blog rather amusing. I’ll echo what others have said about getting a new UI and EQMaps. I used Fetish Nightfall for my UI. The default UI is so painful that I’d avoid the game during patch days until the UI was updated. Really sad because I suspect that turns a lot of people off from what is otherwise a really cool game. If you get bored with your Coercer (I found it hard to play), I highly recommended the Necromancer or Summoner. It’s a lot of fun to play, and pretty easy to solo. I particularly enjoyed playing a Kerra Necromancer. Not sure the revamps over the past year or so if that’s still a good combat. Nice, flexible character, though. Cool, looks like i’m not the only one that jumped on the Steam special to try out all these SOE MMOs (as much as Sony are hated in the MMO area, $5 is still..well $5). Of course i went for the entire freaking collection on Steam, which is like EQ1,EQ2,Vanguard,PoTB,Star Wars Galaxies …and if EQ2 don’t take up all my time past this month, i’ll get the $30 Station Access to sub to all of those MMOs……man looks like i’m gonna have to give up sleeping. Either way back to EQ2, so far i’m enjoying it. There’s a surprising array of things that keeps my going. Even this “Heroic Opportunity” system thing that reminds me a little of AoC’s combo system caught me by surprise…hell group combos!? Not sure how effective they are ultimately, but quite a novel combat mechanic methinks. I’m still in some tutorial zone, can’t remember where exactly [Queen’s something] and even though the GFX are not quite up there, i am still surprised at the animations of the NPCs …like weird dancing goblins and stuff hehe…. You started as a coercer? Hehehehehehehe! Prepare to die — a lot! I’ve got a level capped coercer and don’t die much at all anymore (when 70 was cap I could solo the hardest instances. Darn SOE making named mobs immune to me in the later expansions!) but my kills vs death ratio is still under 40. It was something like 12 when I was 1st starting out, so it’s come up quite a bit since then. . .
That said, it’s an amazing class once you learn to play to its strengths. Definitely my favorite of my 12 characters. Also: Drop the Coercer and make a Kerra Shadowknight, then enjoy being the best solo’ing class in game! Only thing missing is an invis. The problem there is in WoW you have a global cooldown, it feels more responsive in one way as you hit something and then wait often with instant attacks at least instead of waiting 0.5s, hitting and then waiting 0.5s. Its a small difference, but being used to button mashing in WoW (since it doesn’t hurt to hit something repeatedly, especially when there might be a random proc refreshing an ability) it threw me at the start, it actually has taken about 3 months to get out of the habit. I do like the treasure chests too, you never worry about walking away from rare stuff and its a nice mechanic. For me it took quite a while though for EQ2 to grow on me, and like WoW the later expansions (level 50+) were much better (well in WoW I loved TBC, but disliked WotLK but only for gameplay changes, the art was good). One thing that is hard to go back to I find with visuals are the characters, zooming all the way into my Frogloks shows a heck of a lot of detail (the eyes blink animation is fluid, they turn heads to look at people etc, clothing looks perfect). Its clear they put a lot of the graphical budget into the characters, although the art in EQ2 is more variable in quality then WoW sometimes in the worlds, here I find the expansions or zones that have been revamped to be much more consistently high quality.